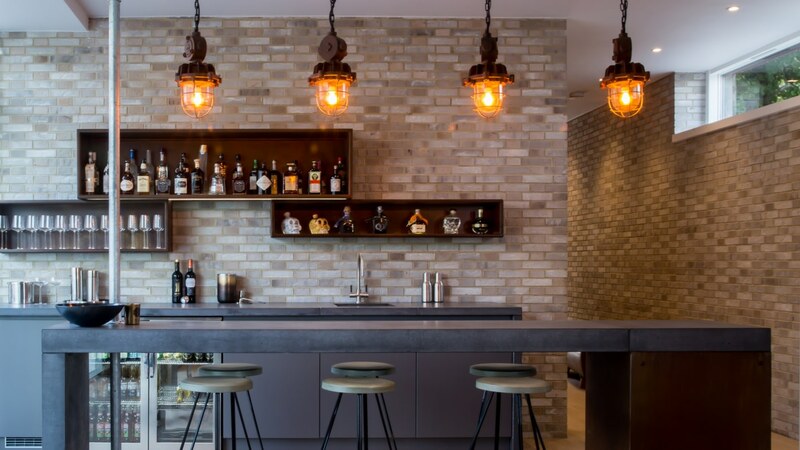 This new-build residential project in Brighton designed by Arior Design has its owner firmly in mind. A unity between the architecture and interior design, the client’s love of music was incorporated into the entertainment areas of the home, including the indoor-outdoor kitchen, bar and entranceway seen here, featuring industrial pendant lighting by skinflint. This included industrial caged pendants by British manufacturer 'Heyes & Co Ltd' salvaged from the outbuildings of a Victorian hospital in Ayrshire, Scotland, UK, plus oxidised industrial lights from the Eastern Bloc from the 1940s and 1950s respectively.